I had a lot of yogurt left, and since I will be gone for a week, I wanted to get it used up. 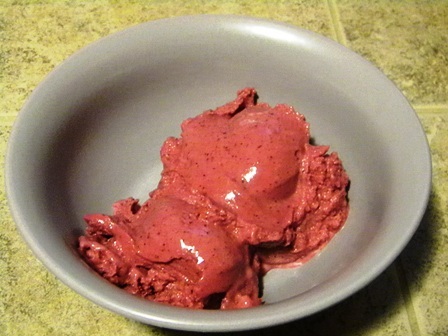 So I decided to strain it and make some frozen yogurt. So, I was able to use it all, and I have something good when I come back! I was going to make strawberry, but a freak snow (not unseasonable warm around here) storm kept me from getting out to the store.I found a bad of mixed berries in my freezer that I had forgotten about. They needed to be used too, so I decided to go with mixed berries. Strain yogurt for 24 hours. Thaw berries, if using frozen. Puree berries in blender. Add honey, vanilla, and yogurt. Blend for several minutes until well mixed. Pour mixture into ice-cream maker and make according to manufacturer’s directions. Allow yogurt to thaw a few minutes before serving. I used 2% yogurt for this recipe, so that makes it freeze a little harder.